Below is a review of GNC Women’s Hair, Skin & Nails Formula. The manufacturer of this product claims that it is a specialty nutritional formula that has been scientifically designed to promote beauty from within. Continue reading to find out more about the ingredients of this product as well as our opinion about its effectiveness. Other ingredients include Cellulose, Titanium Dioxide (Natural Mineral Whitener), Vegetable Acetoglycerides, Natural Vanilla Flavor, Chlorophyll and Sucralose. It is advised to take two caplets of this product every day, preferably with a meal or as prescribed by your health care professional. The product contains traces of fish and soy. You must consult your doctor before taking this product if you are pregnant, lactating, under the age of 18 or taking medication for a medical condition. In case of an allergic reaction to any of the ingredients in the product you need to discontinue use and seek medical attention. You must also discontinue use at least two weeks prior to a surgery. The price of one bottle of this product containing 120 tablets which are enough to last two full months is listed as $19.99 on the website of the company. The manufacturer also offers a discount of $2 per bottle if you become a member. You can also get one bottle for free by ordering two bottles of this product. The manufacturer of this product has offered a 30 days money back guarantee. If you are dissatisfied with the results of the product then you can return it within thirty days of purchase for a complete refund. All you have to do is bear the shipping and handling charges. The manufacturer has also specified that both used and unused product can be returned provided it is in good condition and in the original box with all the necessary paperwork and accessories. There are 300 reviews of this product on the website of the company which are mostly positive. GNC Women’s Hair, Skin & Nails Formula is a nutritional supplement that has been designed to promote beauty from the inside out. It contains essential nutrients such as biotin, antioxidants, lutein and amino acids to promote beautiful hair, skin, and nails. The manufacturer has also offered a 30 days money back guarantee and there are a lot of positive reviews. However, the ingredients of this product include fish, soybeans and gelatin making it unfit for vegetarians, vegans and other individuals. In addition to this, at $19.99 for 120 caplets the price of this product is a little below average and this raises some serious concerns regarding the quality of ingredients used in the product. As a result, we have come to the conclusion that this may not be the best product for you. 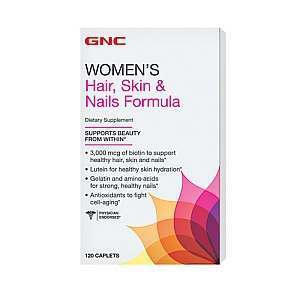 John Brownstone	reviewed GNC Women’s Hair, Skin and Nails Formula	on November 20th	 and gave it a rating of 3.